Yes, yes, the actions of a desperate man and what's more - the first thing that I did was take a photo of its backside, more on that later. Now, the first impressions review. 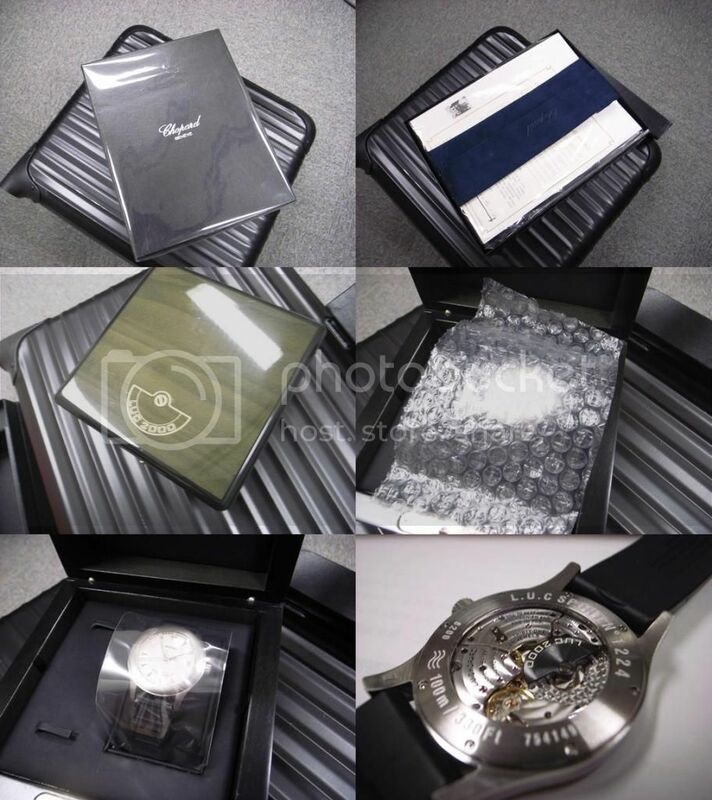 This watch is long out of production and it was a lmited edition of 2000 watches (this may have something to do with its name). 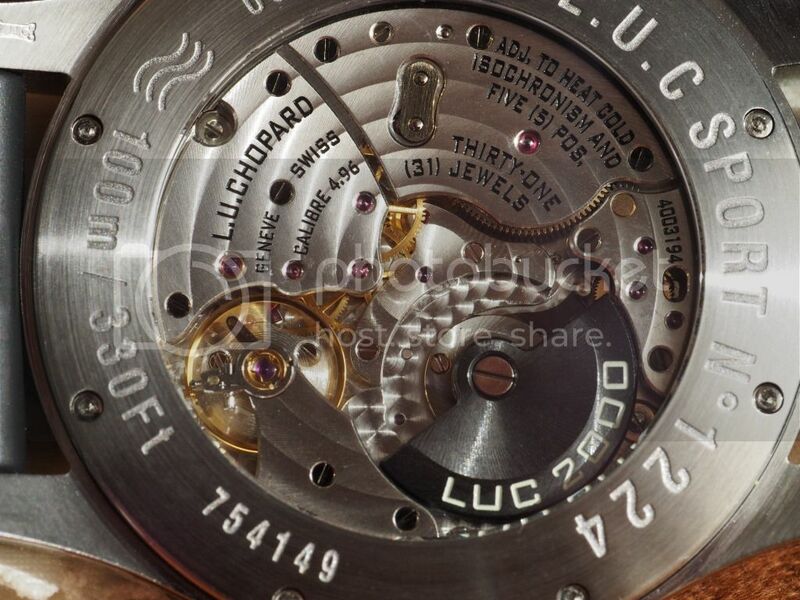 This example is about twelve years old and was serviced by Chopard a year ago. They can still be found used and, very occasionally, new old-stock so a review of a twelve year old watch make sense of a sort. I did my homework, a search on TZ didn't turn up a huge number of hits but in that small number were a couple of "wish I hadn't sold it" posts. I carried out similar research years ago for a Yamaha motorcycle - I phoned a friend who had one, and asked "would you buy another?". The answer was "yes", I got one and it was a workhorse, a reliable continent crusher that racked up nearly 250000 miles before I sold it to move to Japan. Chopard is an odd organisation, worldwide distribution like any other luxury globocorp but I believe that it's still family owned. 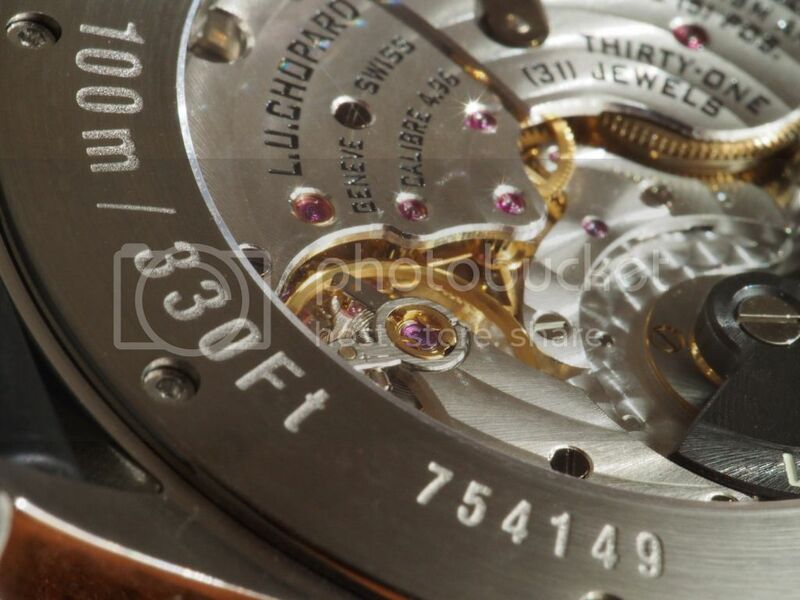 The company also sits on a a couple of dark and dirty secrets, secrets that the watch world would rather keep quiet. The secret? 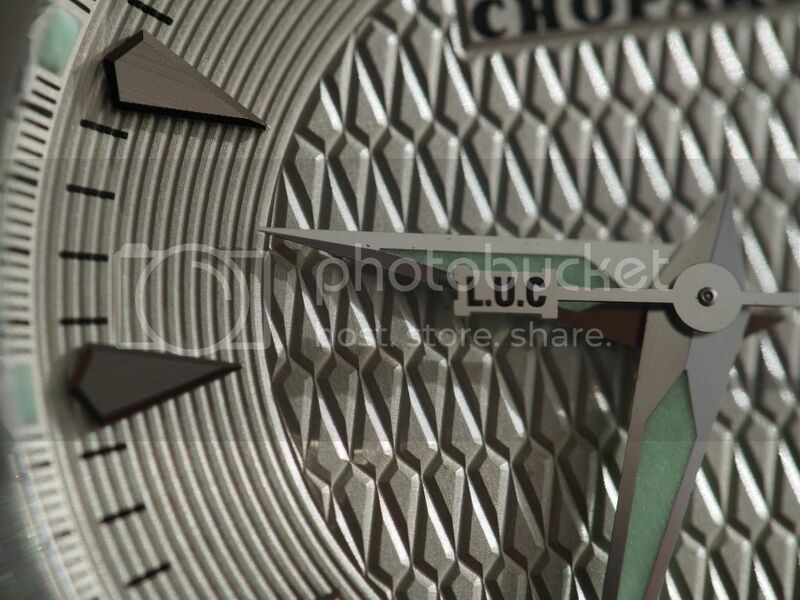 A good movement in a relatively reasonably priced (in the context of -- there's no escaping the term -- luxury timepieces) watch Chopard had (and may still have) a number of watches with JLC and Frederic Pigiet movements in them. I believe that the St. Moritz is probably the least expensive watch available with an F.Piguet engine. What do you do after that? I suppose that the obvious next step is to go it alone and build a series of quality in-house movements. Chopard set up a watchmaking enterprise in Fleurier, not far from Geneva, than went knocking on doors for movement designers. Good move, one of the new neighbours was Michel Parmigiani and Chopard commissioned him to design the n.96 series of movements. These found their way into a range of watches and one of them found its way onto my wrist. There are several variants, top of the range is the 1.96 which is almost exactly the same as the 4.96 save for a jewel somewhere in the drive train, a Breguet overcoil, a swan neck regulator, a Geneva seal, a precious metal... ok, ok, the 4.96 is the cheapskate version. In between is the 2.96 which doesn't carry a Geneva seal. The lowly (context, context) 4.96 makes do with a routine regulator and rotor that looks as if it's been fashioned from bits chipped off of the TMA1 monolith - more of that (the winding bit, not the monolith) later. All variants are heavily jewelled, have a two barrel main spring (with approximately 60 hours running on a full tank, er, wind - it's a Chopard, not a Cartier. 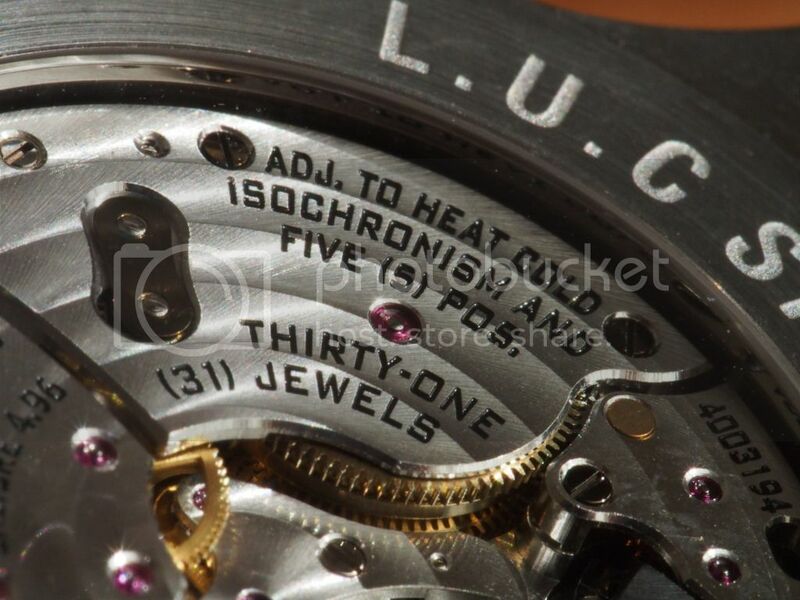 There have been attempts at feeding elegance into its design, it doesn't suffer from the common sports watch defect of trying to fit a small novel onto the dial (and having a woefully inaccurate metres to feet depth rating conversion - diophantine equations are one thing, just don't give watchmakers anything that involves fractional units). 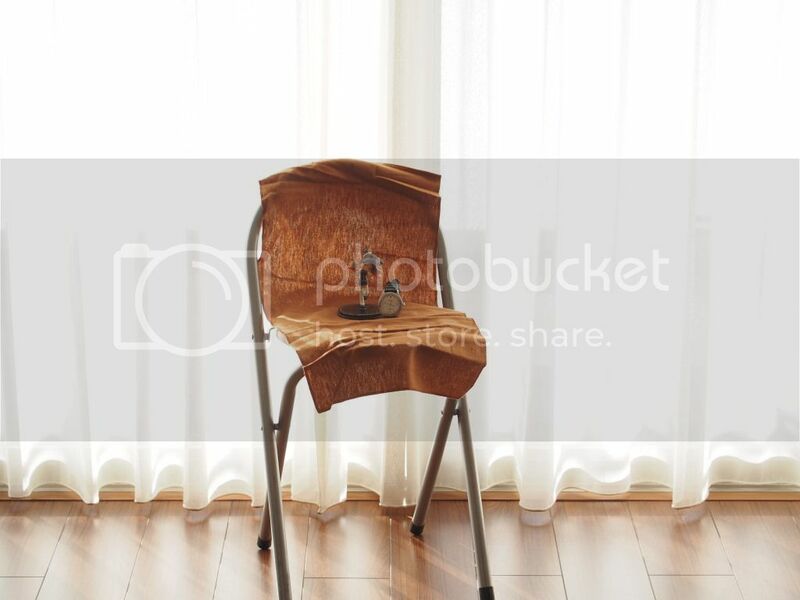 It has got some text there but it's discreet text. 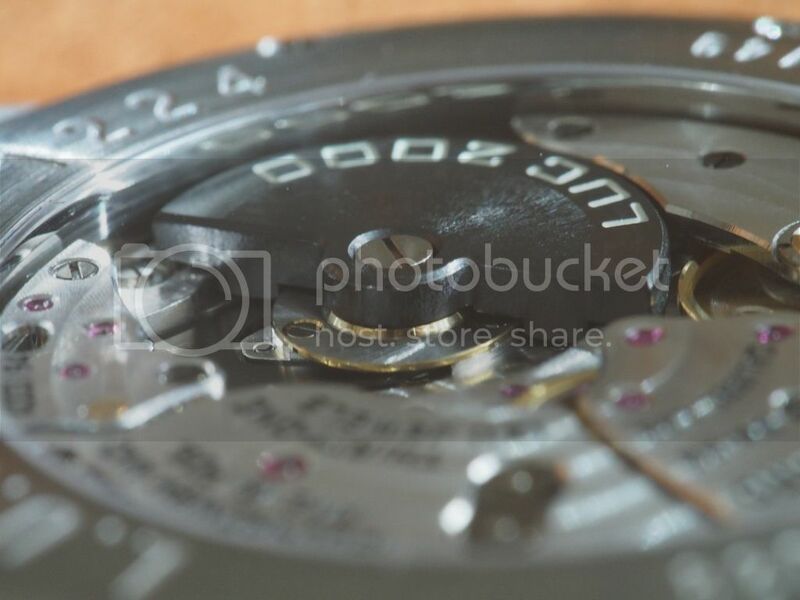 The seconds hand has a tiny luminous pointer at its tip so there's a counterbalance on the other side. That's not so pretty but propbly necessary (indirect seconds hand). Flip it over and in the words of the late Frank Zappa - great googly moogly! 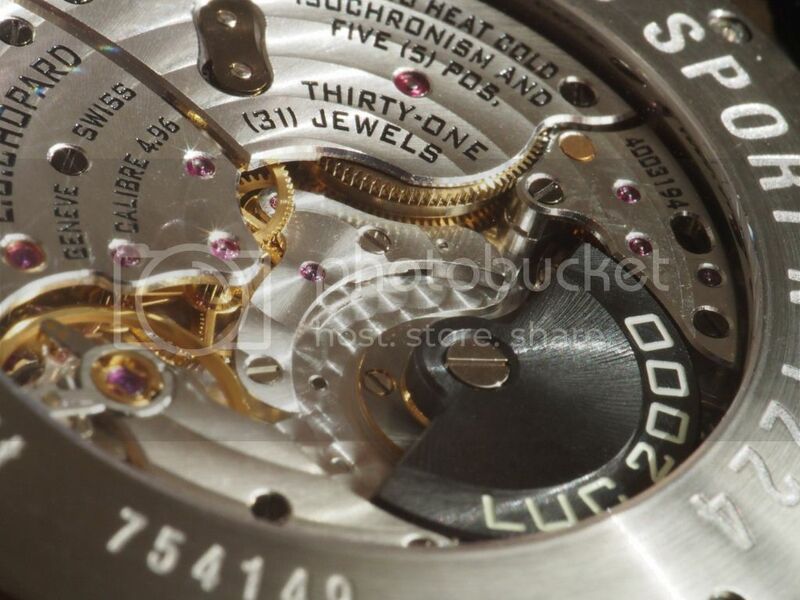 The LUC n.96 series is, I believe, quite a robust movement despite its obvious elegance. 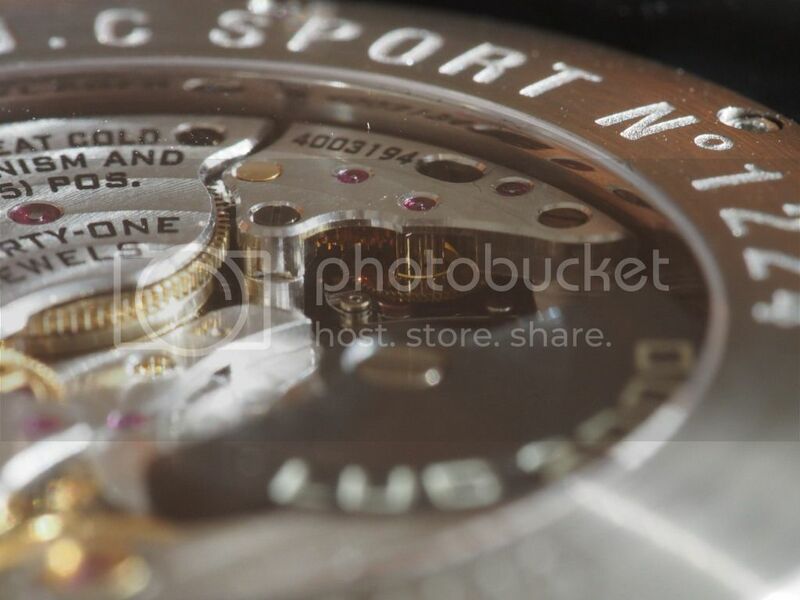 It's 3.2mm thick, that 3.2mm includes the winding rotor which is contained inside the movement's body rather than tacked onto the top like a full sized rotor. 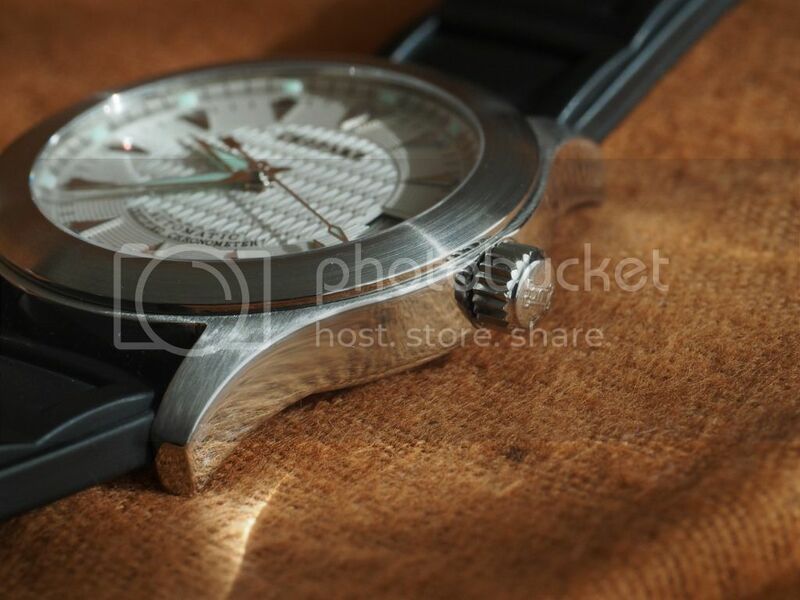 The automatic winding system looks very nice but it isn't going to make it into the pantheon of winding gods. That comes with the territory - the radius is a squared term in the moment of inertia of a winding rotor so it simply ain't going to wind as hard as a bigger rotor. 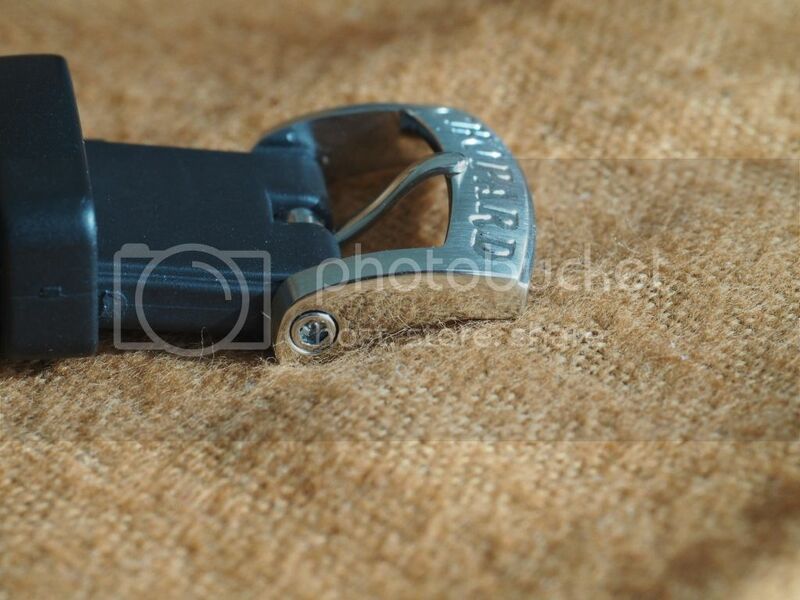 Its smaller size, however, puts much less stress on its supporting bearings and I'd imagine that that brings benefits in terms of robustness. Best of all, though, is that the rotor doesn't act like a mobile fig leaf and leaves much of the watches privates exposed. 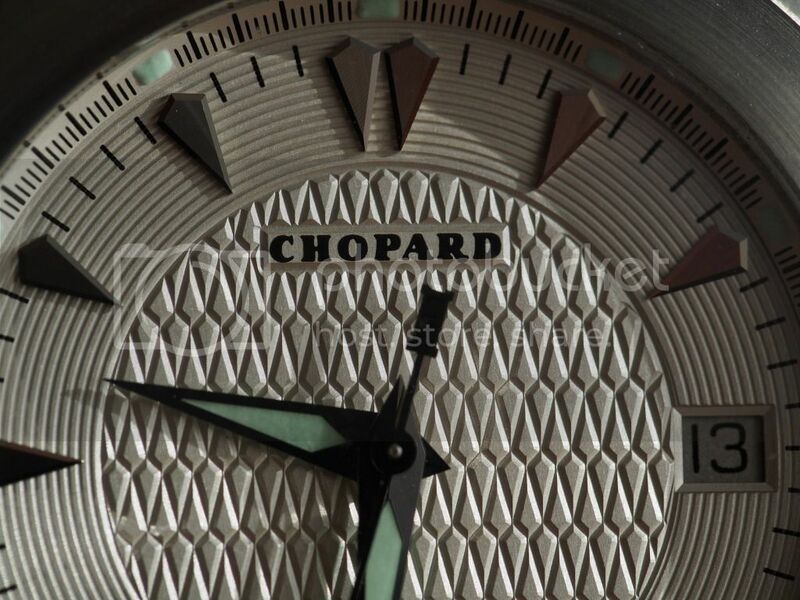 Chopard implicitly acknowledge this, the watch manual indicates that a few turns of the crown wouldn't go amiss when settling it down for the night. Walt Odets' article on the 1.96 movement describes the winding system in detail, the rotor drives a three lobed cam which, in turn, drives a ratchet and pawl system that winds the barrels. 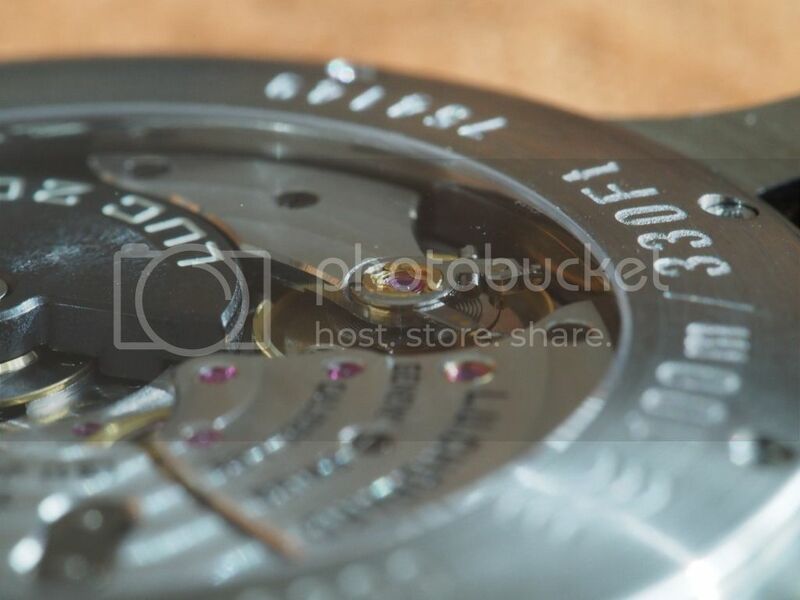 The three lobed winding effort is obvious in the rotor's movement. This is anything but "just another watch", there aren't many that hide something like this under their bushel. In some ways this is a perfect WIS combination, an unassuming appearance but the more you know the more you smile. 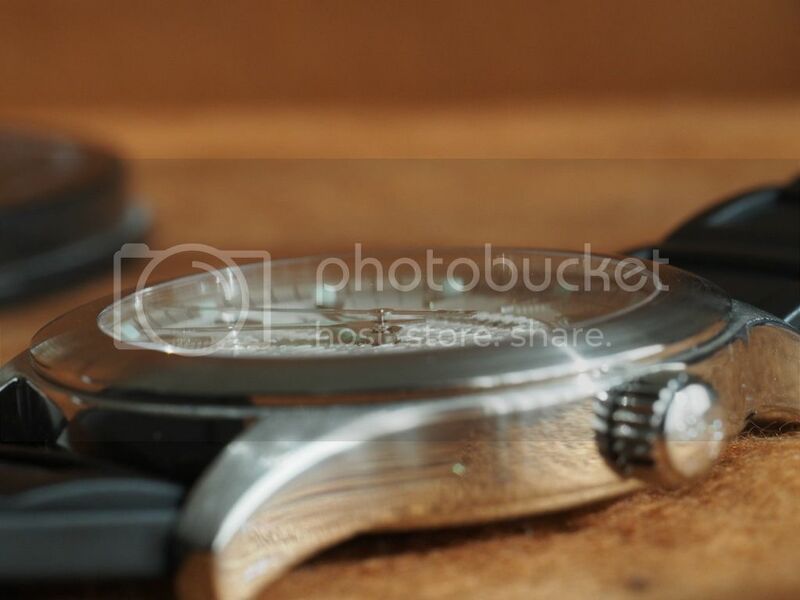 One of the things that bugs me about some watches is the flat sapphire crystal. There are some designs -- early IWC Ingenieurs, Royal Oaks.. sporty watches -- where a flat crystal is fine but dressy watches should never have flat crystals. This is almost flat, tehre's a very slight curvature and its anti reflection coating makes for easy reading at any angle. 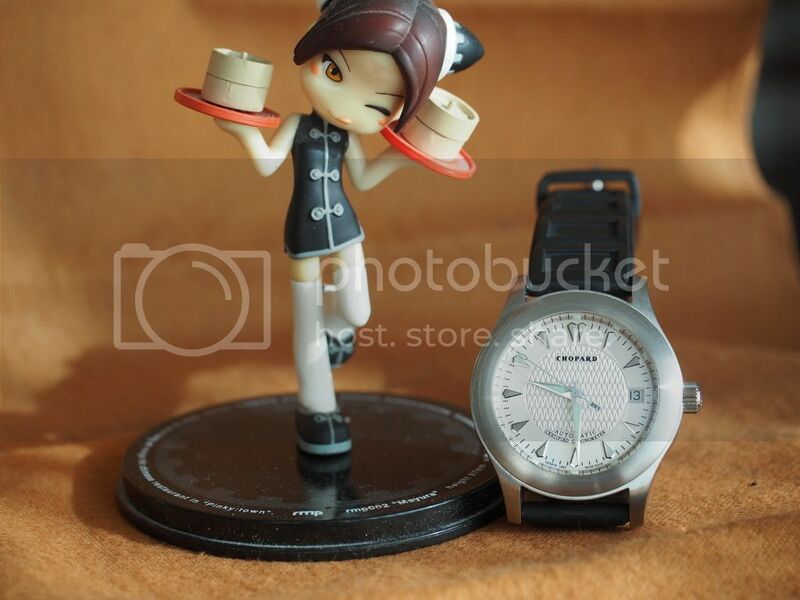 Its rubber strap is chunky and has a good quality feel, it reminds me of the better Seiko dive watch straps. The watch originally came with an alligator strap as well, I've only got the rubber one and will chase up a nice alligator band soon. 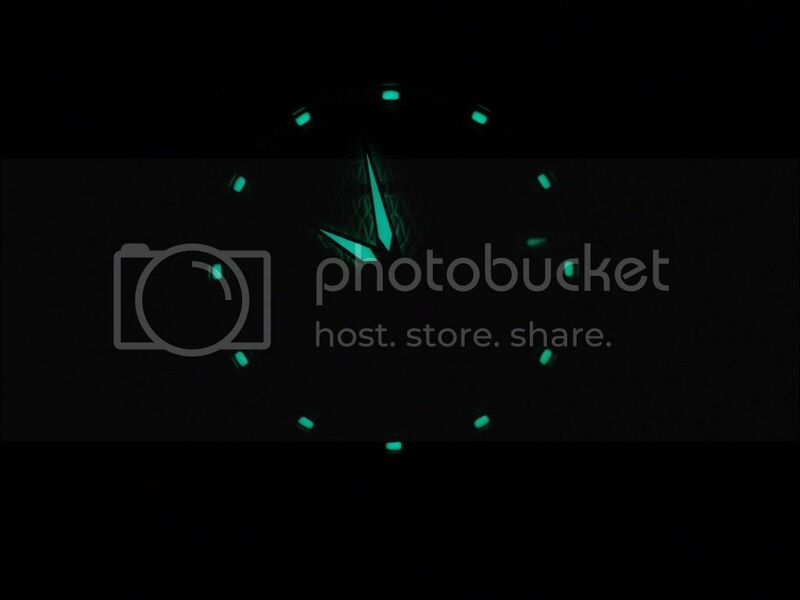 This obviously isn't a tactical ninja watch, the Luminova glow needs an occasional jolt of photons to nerf some electrons out of their preferred orbits (that's where the glow comes from, it's awfully dark at electron level so they get their torches out to find the way back to their home orbits) and without this its glow will gradually peter out but once it gets a glowing it can keep it up all night. If you're looking for something to wear when hiding for two weeks in a tiny dark cupboard waiting to leap out and do ninja things then this, perhaps, isn't the watch for you. That's a small price to pay though, Luminova doesn't have a half life so after its daily jolt-of-photons (TM) it still glows away with smug satisfaction and should continue to do so for years to come. This one was serviced by Chopard about a year ago and using my usual method of accuracy checking - Shinkansen departure times - it's been at least as good (over only four days) as my Seiko GMT. The GMT was last set about ten weeks ago and it's still fine, it's set a tough target. Official watch review score sheet - Shiny: yes. 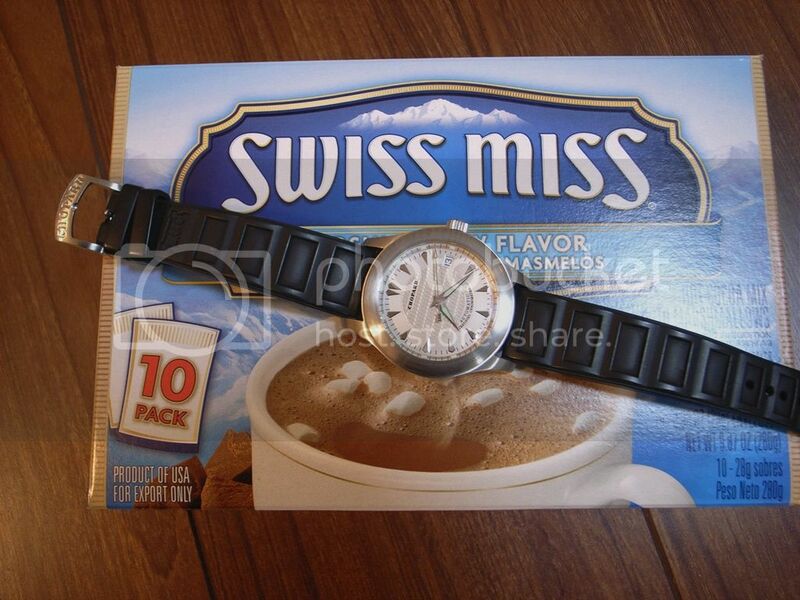 Swiss Miss? No, this one is a hit.